A local towing company needed an online presence to help it get found by people in need of local tows. 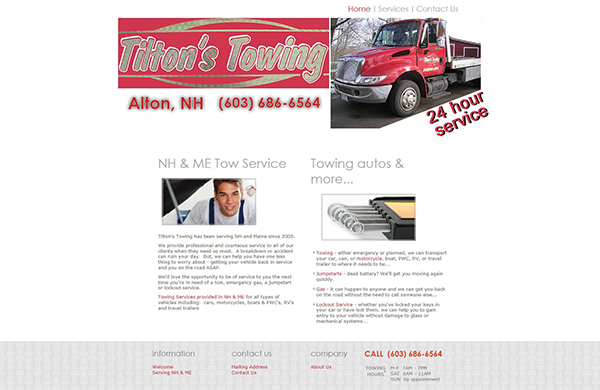 With a mobile-friendly design, people searching from their smartphones while in need of tow services are able to locate this professional service provider's basic business website without any problems. 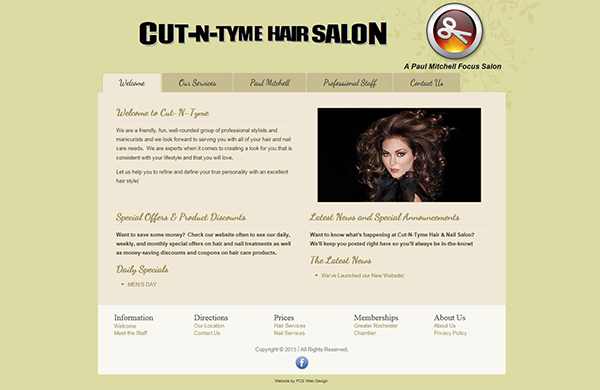 Cut-N-Tyme's co-owner's knew they needed a new look for their website. PCS Web Design was able to create a website that incorporated their personal vision as well as a color palette taken from the salon's actual interior! A CMS-enabled design lets the owners update their website with daily, weekly, and monthly specials as well as feature their staff members' profiles. 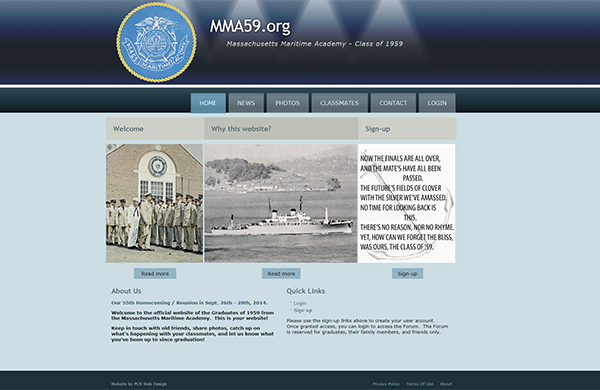 PCS Web Design was approached by a graduate of Massachusetts Maritime Academy, class of 1959, to build a CMS-enabled website that would allow he and his fellow classmates to communicate and plan for their 55th class reunion. The reunion was a success and the site fostered communication between some of the classmates who hadn't seen each other in quite a few years. The site has a 'classmates only' section where stories, information, and even recipes can be shared among the classmates. The owner of PCS Web Design, a Rotarian, donated his time and talent to design and create the Polio Campaign 35 website following a discussion with another member of the Alton Centennial Rotary Club about a fund-raising idea that centered on Rotarians in their club making a commitment to make three donations of $3.50 during the month of November. The website was created to share this idea with the sixty Rotary Clubs in District 7870. The aforementioned member of the Alton Centennial Rotary Club, ADG David Countway, and his wife Sylvia made a personal trip to Pakistan in 2012 to participate in Rotary sponsored Immunization Days. Since making that trip, David has inspired and worked with other Rotarians throughout District 7870 to keep Rotary's efforts to End Polio Now always in our thoughts. And, if all goes as planned, by the end of 2018 the world will see the end of this devastating disease. 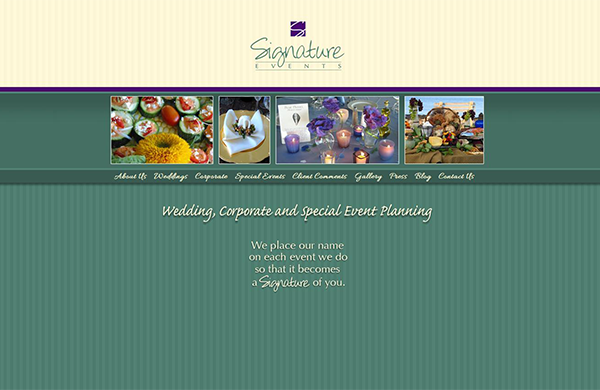 Signature Events owner Amy Piper, a premier event and wedding planner, had some pretty specific ideas when she had her website originally designed. In fact, it was very important to her that the look-and-feel of her new website not change significantly. PCS Web Design was tasked with upgrading the original static website to a CMS-enabled design so that the business owner could update and add new photos to her extensive galleries efficiently without having to dig into any HTML or CSS. The results, which took some planning (no pun intended! ), spoke for themselves - the new website looks and behaves almost identically to the original but it is now on a powerful, robust, and stable CMS platform.